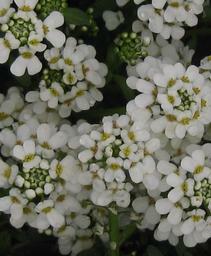 'Snowflake' Candytuft is a neat little evergreen perennial which is excellent for rock gardens and walkways. 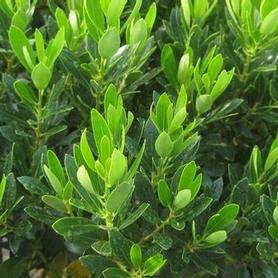 The small lustrous green leaves and stems are topped by showy flat white flower clumps in April and May. 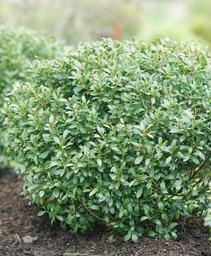 Iberis sempervirens 'Snowflake' has a cascading habit, so it is a good choice for mixed containers or short walls. Flowers of this native woodland plant, Dwarf Crested Iris, are a soft delicate blue in May. 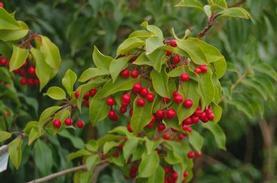 They are displayed above the flat green leaves, and have a showy yellow crest. 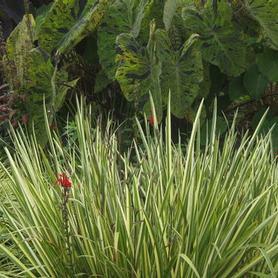 Iris cristata foliage almost disappears by mid summer. 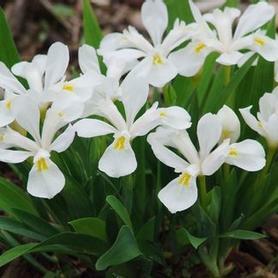 The delicate white flowers of White Dwarf Crested Iris have yellow crests and they bloom in May. 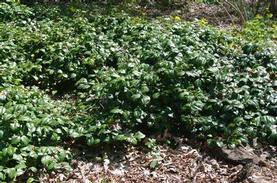 Makes a slow-spreading ephemeral groundcover. With yellow-crested, powder blue flowers, 'Powder Blue Giant' is more vigorous and has larger flowers and leaves than most Dwarf Crested Iris. 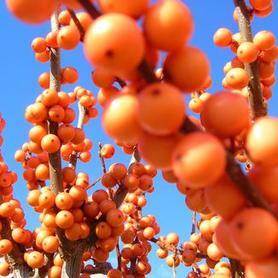 It starts blooming in May. 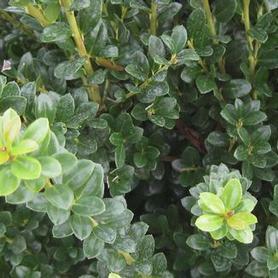 A slow spreading groundcover. 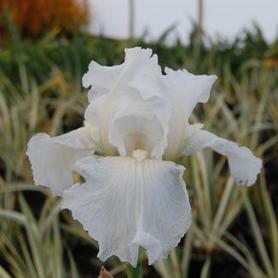 'Tennessee White' Dwarf Crested Iris is a long blooming, vigorous selection sent by Don Shadow to North Creek Nurseries. 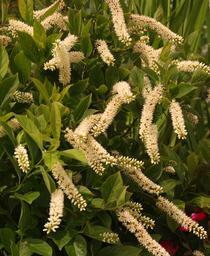 Lots of large white flowers accented by yellow crests appear in May. 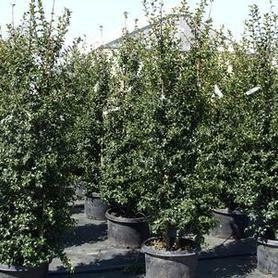 A moderate spreader and a real show-stopper in spring. 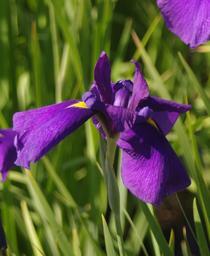 'Cry of Rejoice' Japanese Iris has showy large flowers in June, in attractive shades of magenta red with yellow signals. 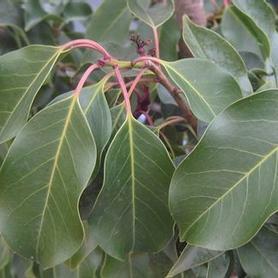 The green leaves are sword-like and remain upright through the summer. All Iris ensatas tolerate average to dry soils, but really flourish is wet sites. 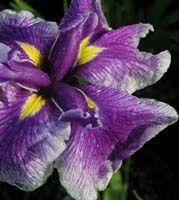 'Crystal Halo' Japanese Iris has large dark purple flat flowers with white edges, blooming in June. All Iris ensata varieties are wet site tolerant. 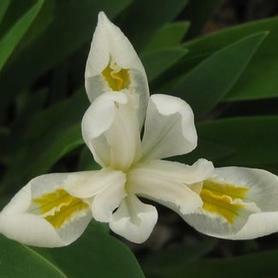 They were formerly named Iris kaempferi. 'Happy Awakening' Japanese Iris blooms in June, with flat magenta-pink flowers that have dark veins and contrasting yellow centers. 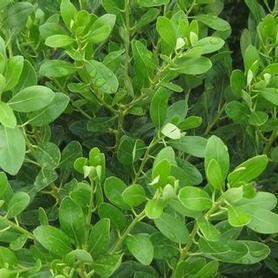 The excellent wet site tolerance and the deer resistance make this a great garden or bog plant. 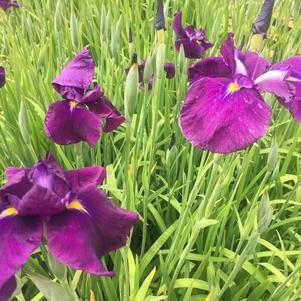 'Loyalty' Japanese Iris has large double flowers on long stems in June. 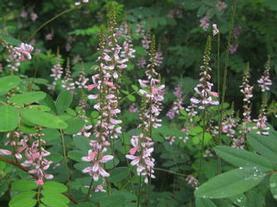 The petals are a showy deep purple with yellow stripes on the purple crests. 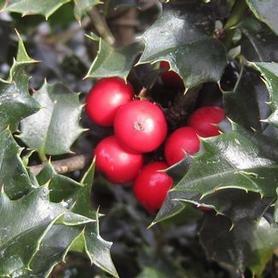 Excellent for use in wet site, along streams and around ponds. 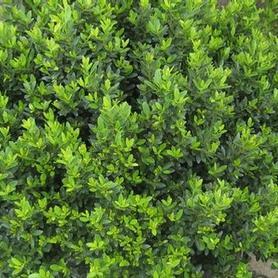 Variegated Japanese Iris has purple flowers in June, and striking white striped leaves. 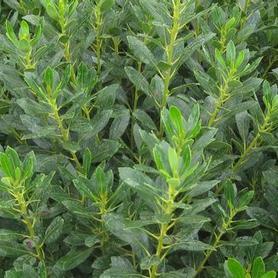 Does well in wet sites. 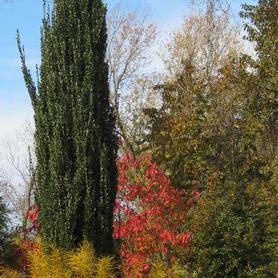 The foliage is showy all summer. 'Best Bet' German Bearded Iris produces tall spikes of large flowers with blue standards and purple falls. 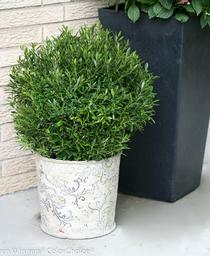 The two toned effect is very showy, blooming first in May and June, and then reblooming in September and October. 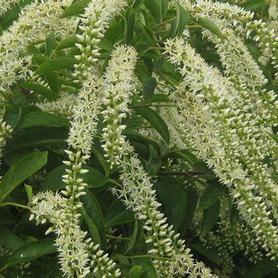 The sword-like green foliage emerges before the flower spikes, and fades by late summer. Good drainage is a must for Iris germanica cultivars. 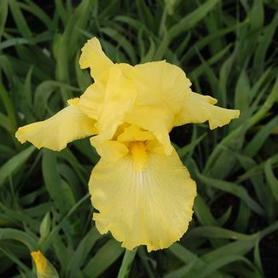 The large bright yellow flowers of 'Harvest of Memories' German Bearded Iris appear in May and June, with the addition of reliable fall blooms. 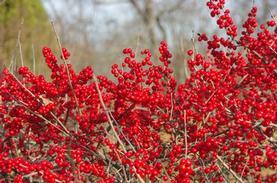 An amazing flower to see in October! 'Immortality' German Bearded Iris has very ruffled pure white flowers in May and June, with reliable late summer and fall re-blooming. 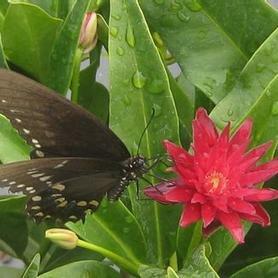 The large flowers turn heads in September and October. 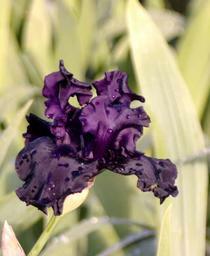 'Superstition' Bearded Iris has such a dark purple flower that it almost looks black. 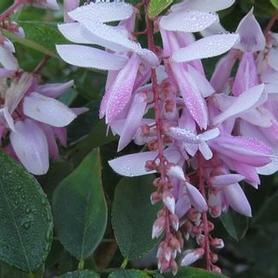 The blooms are fragrant and large, making a striking addition to cut flower arrangements (even though the individual flowers each last only a day). 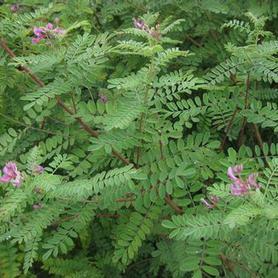 The flowers spikes bloom above the wide straplike leaves in May and June. 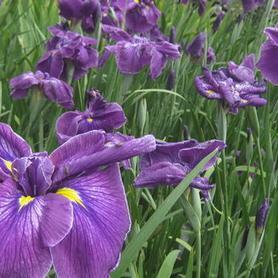 All German Irises perform best in dry or well drained sites. Iris germanica 'Superstition' is the darkest flowering germanica. 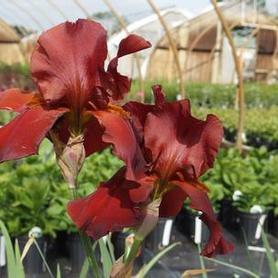 'War Chief' German Bearded Iris blooms in May and June, producing lots of large velvety dark red flowers. 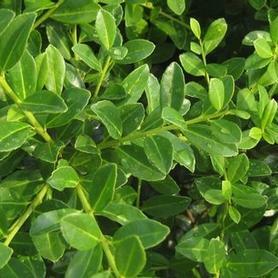 They are held above wide straplike green foliage, and are a good addition in the back of well drained perennial beds. Iris germanica 'War Chief' is a useful and fragrant cut flower, since the stems have multiple buds that open in succession. 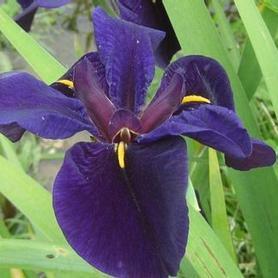 'Black Gamecock' True Water Iris has deep purple-black flowers in June over strap-like foliage. 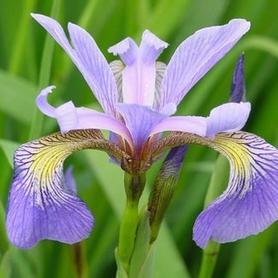 This Iris loves water and warm temperatures and does very well in bogs and on the edges of ponds. 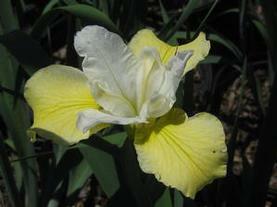 'Butter and Sugar' Siberian Iris blooms in May, and is a striking bi-color combination of white and soft yellow. 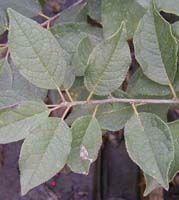 The green sword-like leaves are clean and disease resistant. 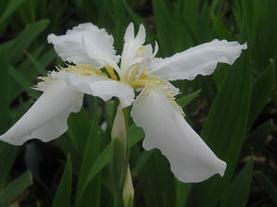 All the Siberian Irises thrive in very wet sites as well as average soils. 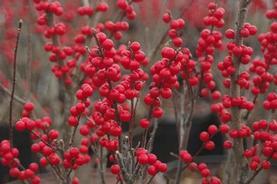 Try it beside streams, ponds and bog gardens. 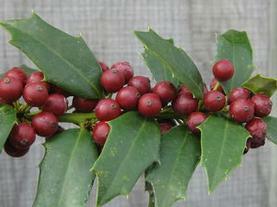 The long stems make 'Butter and Sugar' an excellent cut flower. 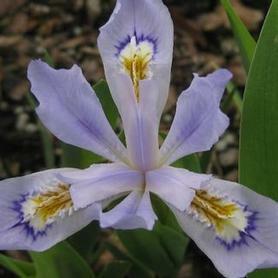 The purple-blue flowers of 'Caesar's Brother' Siberian Iris appear in May. 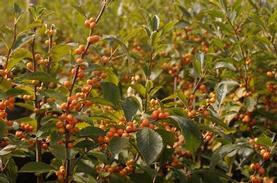 It is wet and dry site tolerant, and is the mainstay of so many perennial gardens. 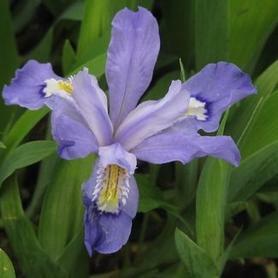 PRN Preferred: This is the classic indistructable blue Iris which never needs "babysitting". White Japanese Roof Iris gets its name from its presence on thatched roofs in Japan. Iris tectorum var. 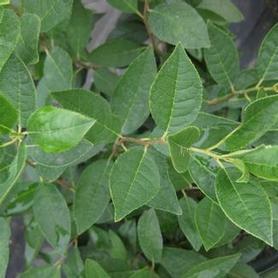 album has large white flowers with yellow throats, appearing in late April to early June. All the Japanese Roof Irises spread to make wide patches eventually, and do best with adequate moisture but good drainage. 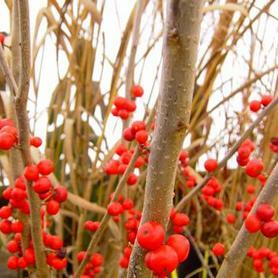 It is the Asian equivalent of Iris cristata 'Alba', but much bigger and not ephemeral. A hard-to-find Iris. 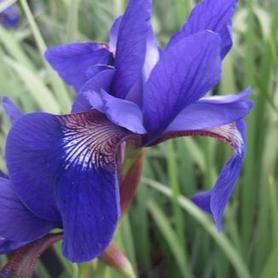 Blue Flag Iris blooms in May and June with beautiful blue-violet flowers that have yellow throats. 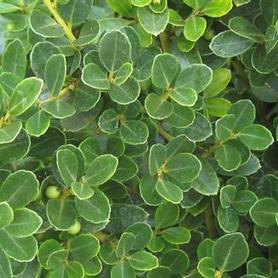 Although it will grow happily in regular gardens, it is indispensable for bog gardens, wet meadows and streamsides. Iris versicolor's nutrient filtering ability makes it particularly useful in retention basins and bioswales.